The Company Meninos do Pólo started in 2004, emerging from a project, which was developed in one of the Dance Workshops in one of the poles of education (Pólo Presidente Arthur da Costa e Silva) offered by Rio de Janeiro City Hall. The aim of this project is to offer free courses to lower class teenagers from different communities. Youths whose ages vary from 14 to 18 years old, from eleven different lower class communities, form the group. Along with the group of dancers, there are the two directors, Claudia Paiva and Cassiana Rodrigues and one musician, Jaffer Ferreira. 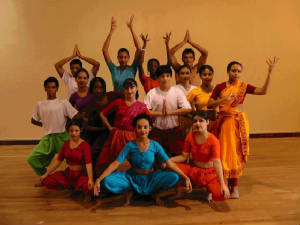 The work already developed aims to associate Indian Classical Dance (Mohiniattm, Kathak and Kuchipudi) and Modern Dance. Claudia Paiva has graduated in Arts with a master degree in Art History. With more than 20 years of experience in dance she specialized herself in Ballet, Belly Dance and Kathak. She also studied with many important international dancers as Hadija, Farida Fahimi, Manju Bharggawel, Loren Steven and many others. Jaffer Ferreira is a musician specialized in indian percussion so as pakhawaj, bhajana cekallu, kertels, morsing, ghatam and arabian percussion as the derbak. As a great percussionist he joins many groups of oriental music as Grupo Raga, Luz da Ásia, Grupo Gitanjali, Concerto em Cinco Cordas and Grupo Aziz.